The temperature is held at a constant -1 degree Celsius to -2 degrees Celsius except when making snow where they take the temperature down to -7 degree Celsius to -8 degrees Celsius (at night). 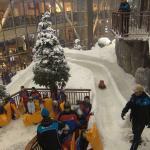 There is also a snow park winter playground for the kids to ride carpet sleds, play in the tunnel and even take a toboggan down the luge like run. The price of admission includes equipment and clothing rental. 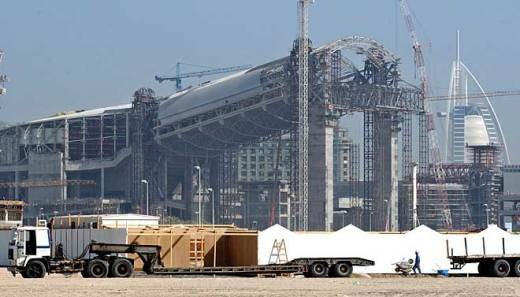 There is also an insane plans to construct a much larger "Ski Dome". The current facility offers a ski school with lessons for beginners and for those wanting to improve their skills. For non-skiers there are fun distractions including a zip line, a climbing tower, interaction with Gentoo and King Penguins, tubing and sledding. Of course there is dining and shopping in the mall. There is no terrain resembling a chute. Take the chair to the top and go left. This run has the steepest section on the "Mountain". The run to your right maintains a constant grade. 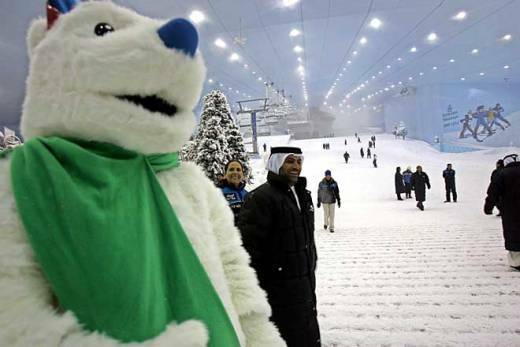 You will find Dubai's finest mogul run to be the one you create with a shovel. Please don't mistaken a fallen skier with a white turban and dishdasha as a mogul. Remember that moguls do not scream when you ski over them. 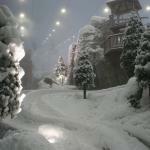 Yes they do have a few plastic fir trees but not enough to ski around and no powder. Out of bounds areas are without snow which ruins the allure of the out of bounds area many seek in the Rockies. Dubai is kind to beginners with plenty of gently sloped terrain. With 100% of the trails dedicated to beginners, you can't fall prey to a dangerous double black diamond. Bummer eh. They claim a single black diamond run (upper skier right). You are most likely to fall if pushed in the lift line. 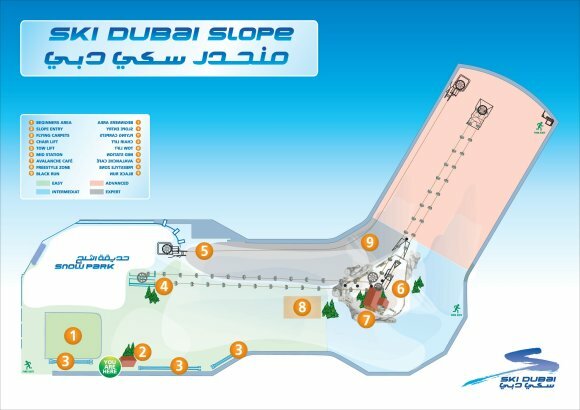 YouTube video of skiing in the Dubai ski structure. There is one terrain park with a 90 meter quarter pipe (11ft/3.5m radius). Apres Ski Bar recommendations: Try the "St. Moritz Cafe", complete with fireplace or the "Avalanche Cafe" at mid-station. 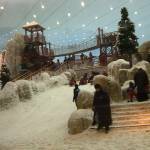 This "resort" has two themed restaurants: St. Moritz Cafe (entrance) and Avalanche Cafe (mid-station) There are also 65 restaurants in the adjacent and ginormous "Mall of the Emirates". 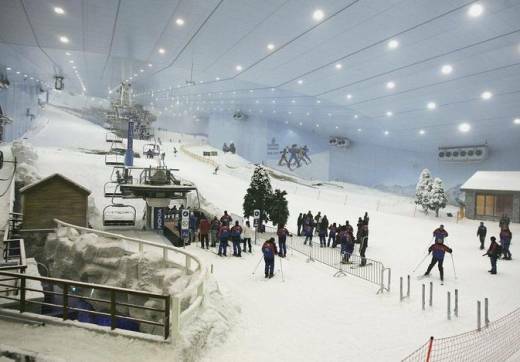 Unlike most ski areas this is located in a city, the city of Dubai. 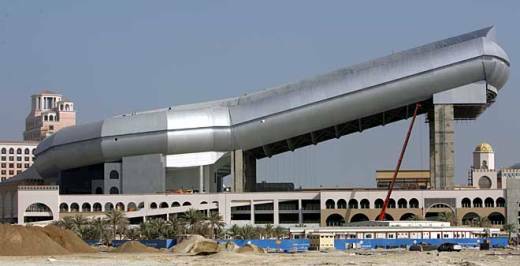 The "Ski Dubai" structure is attached to a shopping mall. You really don't have to travel very far for good shopping. 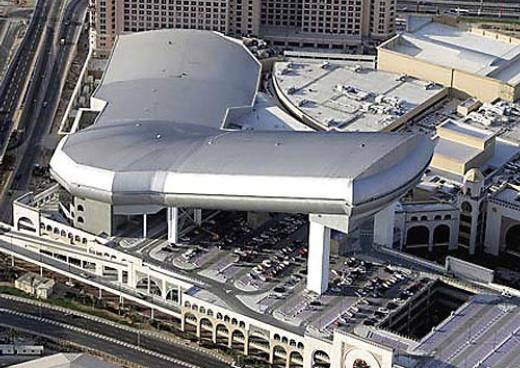 The "Mall of the Emirates" has 425 stores, 65 restaurants and a 14 screen cinema!. 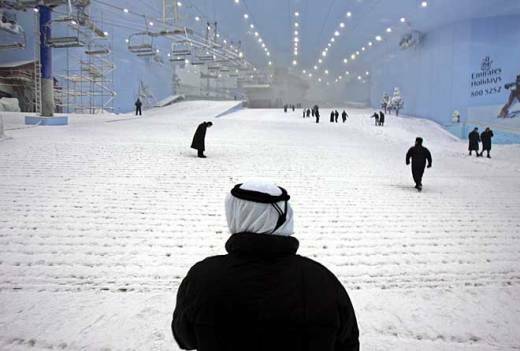 Satellite view of the "Mall of the Emirates"
Snow World - Landgraff, The Netherlands. Eight lifts and over eight acres. World Cup training. Intermediate terrain with 550 feet of vertical. Also has an ice wall. Kempinski Hotel Mall of the Emirates: A five star hotel attached to this mall.